We were delighted to welcome renowned air display pilot Rod Dean as guest speaker at our Annual General Meeting and Enthusiasts’ Event on Saturday 9 April 2016. 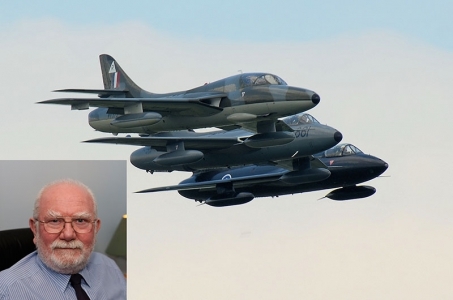 In his talk Rod Dean described his introduction to display flying on the Hawker Hunter when he was based at RAF Chivenor, Devon, in the early 1970s. He then explained what it was like to display vintage jets such as the Vampire, Venom, Meteor, T33 and F86A Sabre plus, of course, civil-registered Hunters. His talk was illustrated with photos from his own collection as well as a number of short videos, and he went through the technical details of the various aircraft in his usual entertaining and easy-to-understand style.